Home / Latest / Welcome to el Sadar – Can Real Madrid breach the Pamplona stronghold? Real Madrid can be under no illusions ahead of this weekend’s trip to the Estadio Reyno de Navarra. Victories over CA Osasuna at their intimidating home stadium are rare and as Barcelona will testify, a defeat at the hands of one of La Liga’s unsung clubs is a distinct possibility. In fact, only Real Madrid and Barcelona have suffered fewer home defeats than the Navarrese over the past three seasons. Just why is it so difficult to win at the stadium the locals still call El Sadar? Well for a start, Osasuna has a direct, high octane style of play. Add to that the tight confines of the stadium, where it feels as if the crowd are on top of the players and you have a potent mix. But there is also a special ingredient that is only found in this region of Spain. This is Basque country. Although the Region of Navarra is not formally part of Euskadi, try telling anybody associated with Club Atlético Osasuna that they are not Basque. Osasuna, which actually means “health” in Basque, was formed in November 1920 and for the first two years played their home matches at two venues, Campo del Ensanche & Campo del Hipódromo, both of which as the latter’s name suggests, were close to Pamplona’s racehorse track. Then on 21 May 1922, Osasuna beat Arenas Getxo 2-0 at a new ground close to the Parque de la Ciudadela. The name of the new enclosure was Campo de San Juan. The club first rose to prominence with promotion to La Segunda in 1932. This was followed three years later with promotion to La Primera and an appearance in the semi-finals of the Copa del Rey. Over the next thirty years, Osasuna played the majority of their football in La Segunda, but they also racked up 8 seasons in the top flight. At its peak in the 1960’s, the Campo de San Juan had a capacity of 20,000 with a mix of stands, arranged tightly around the pitch. The southern terrace, with its very shallow cover held over 7,000 spectators and had an ornate exterior, which featured the club’s crest and 20 flag poles. The west stand had an upper seated tier and this extended around the corner for a few metres and joined up with the rather ramshackle north stand, which was the oldest structure at San Juan. The east stand was the newest build and featured a single seated tier under a propped cantilevered roof. 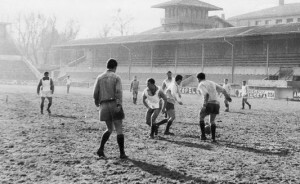 The directors at CA Osasuna decided in May 1965 that the Campo de San Juan had more potential as a piece of real estate than a redeveloped, modern stadium. So the site was sold the municipality for 40 million pesetas and a new plot of land was purchased for 10 million pesetas a couple of kilometres to the south of Pamplona. Tomás Arrarás was charged with designing the two tiered fully enclosed stadium and work commenced in October 1966 on the 51 million peseta project. The new stadium was named El Sadar after the Rio Sadar that runs to the west of the site. It had an initial capacity of 25,000 of which 7,000 was seated. 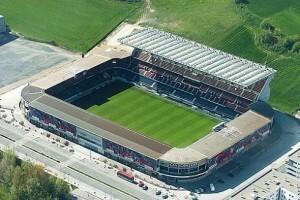 The stadium opened on 2 September 1967, but unusually Osasuna did not take part in the first match. That honour fell to Real Zaragoza and Vitoria Setubal, who were invited to compete in a triangular tournament with the hosts. Whilst the move was considered necessary for the long term future of the club, the construction had left the club with little if anything to spend elsewhere and this was reflected in the team’s performance. At the end of the 1967-68 season, Osasuna finished a lowly fifteenth in La Segunda and dropped to the Tercera for the first time in twenty years. The following decade saw a continuous journey back and forth between the second and third divisions. It was the 1979-80 season that finally saw the club make the most of its stadium. 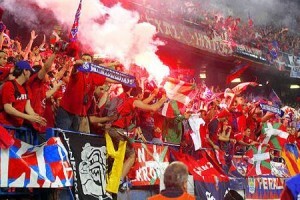 Osasuna won 17 of their 19 matches at home and eventually secured third place and a return to La Primera. Incredibly, despite one of the smallest budgets in La Primera, Osasuna defied the odds throughout the 1980’s and whilst there were a few close run-ins with relegation, more often than not, the club achieved a mid-table finish. This stability in the top division prompted the next phase of the stadiums development. In 1989 a new Tribuna was added to the west side of the ground at a cost of 561 million pesetas. This was however privately funded and Osasuna having cleared their liabilities, remained debt-free. The new stand was an impressive addition, with a deep cantilevered roof that hovered over the lower tier and a sweep of red seats, raked at an alarming angle. As a result the capacity of the stadium increased to 30,000, with 12,000 seats. It was converted to an all-seat arena in the late 1990’s reducing the capacity to 20,000 and the pitch was lowered by two metres in 2003, allowing room for a few more seats, but also improving the site lines. In December 2005 the Navarrese parliament approved the payment of 4.2 million euros to the club which resulted in El Sadar becoming the Estadio Reyno de Navarra, or Kingdom of Navarra Stadium, to tie in with the Region’s tourism slogan. The stadium remains a fortress and in recent seasons it has been Osasuna’s most potent weapon, with the top teams finding points hard to come by. Changes in the past decade have seen club offices, supporters club, retail outlets and restaurants all open within the complex, making it the hub of all club activity. It is without doubt, a well run provincial club with total fan input and in a football world that is becoming increasingly more corporate, this fact alone makes Osasuna the envy of many other clubs, big and small. It’s a massive game for Madrid tonight and I’m hoping Osasuna play like they did against Barca. Mendilibar has done an unbelievable job this season and it would be amazing if they qualified for Europe on the budget (or lack of it) that is available to them.